The new Del Morino RES 15 backhoe has all the typical uses of a backhoe – but with the size to work in really small areas. Found all sorts of reasons for putting off building a water feature on your block? SOTA Tractors has just taken away the biggest one: not having the right equipment. The Res 15 Del Morino backhoe. Creating a water feature is just one of the many uses of this fantastic piece of Italian machinery. It has all the typical uses of a backhoe – digging, maintenance, drains, trenches, construction, small demolitions, other landscaping or breaking up asphalt and paving. But the beauty is it’s small enough to work in really small areas. “But,” says Crakanthorp, “just because it’s small, doesn’t mean it’s light on strength. As with SOTA’s larger Del Morino backhoes, standard features include a 180 degree arm rotation with side shift lock, high performance cast iron pump, case hardened rectified steel pins at all pivot points, sintered and self lubricated bushes, easy access and an ergonomic seat with adjustable working position, and stabiliser legs with locking valves. 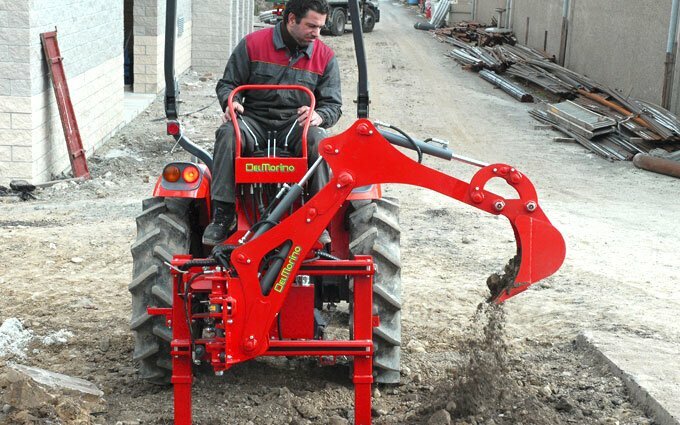 Del Morino, made in Italy, is one of the world’s leading manufacturers of small acreage implements. In fact, Del Morino implements are made in Michelangelo’s home town of Caprese, so quality goes with the territory,” Crakanthorp says. 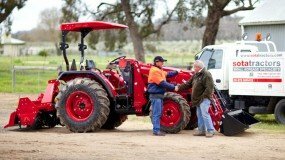 SOTA Tractors is the exclusive importer of Del Morino implements in Australia. More information on Del Morino backhoes.